For a chance to Win 5 free driving lessons! Simply like and share ALBA driving school Facebook fan page. 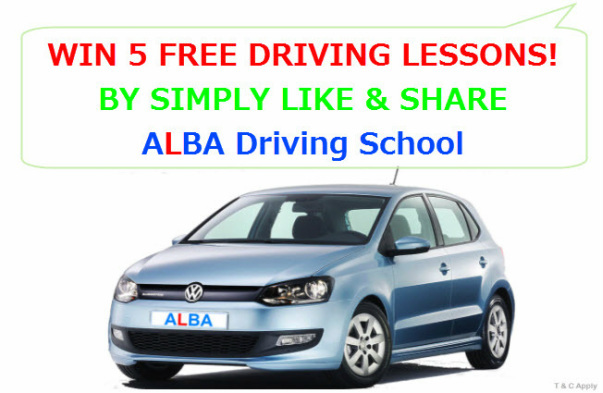 We are giving away 5 free driving lessons every month to ALBA Facebook fan page. All you need to do to enter the free prize draw, is to like & share our Facebook page. The winner will be picked at random from our Facebook fan page. Every time we pick a winner, whoever has recommended them will also be awarded 5 free lessons too, so inviting your friends to like us will increase your chances of winning even further! Entering the prize draw is easy! Just go to our to become a friend and "Like" us, that's it. You're entered! All prize draw Winners will be notified via their Facebook accounts within 48 hours of each prize draw. Terms and Conditions. All entrants must be 17 years or older and hold a valid UK provisional driving licence or a suitable foreign driving licence & must be a beginner driver meaning never had any lessons before. The promotion starts on 1st of January and will run until 30th December 2019, or an earlier date announced by the promoter. The Prize draws will take place once a month on last day of each month provided the ALBA Driving School Facebook page has accrued at least 100 "likes" per month / since the last price draw. All winners will be drawn at random from those participants who have "liked" The ALBA Driving School Facebook fan page since the promotion start date. Winners will be notified via their Facebook within 48 hours of the prize draw and have 15 days to claim their prize and to notify us of the name of the person who recommended them. The person who has recommended the winner will also be entitled to 5 free driving lessons provided they have "liked" ALBA Driving School Facebook page and will continue to be a fan. The winer will be published on our website or Facebook page. The prize is subject to availability! In the event that ALBA Driving School doesn't cover the locality of the winner, They will be offered the 5 free driving lesson with the nearest ALBA Driving School instructor instead. In the event of non-acceptance of the prize, or if the prize draw winner is discovered to be ineligible, ALBA Driving School reserve the right to reissue the prize to the next winner drawn at random or to withdraw the prize entirely. Prizes are non transferable from one person to another and cannot be exchanged for any other prize or any cash value. This prize draw is only open to UK residents. ALBA Driving School reserves the right to end this promotion at any time.